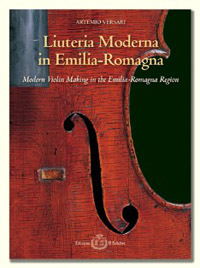 Modern Violin Making in the Emilia-Romagna Region is the first important book of information and consultation for violin makers, dealers, collectors and enthusiasts. The work presents a wide panorama of instruments made both by the most famous violin makers of the period and by those who are less well known, but who are equally important from the historic-documentary standpoint. Seventy authors are present, for a total of ninety-one instruments published, with biographical notes for each violin maker and technical-descriptive data for each instrument. This is an effective synthesis to give readers more information and guide them through the historical context of violin making in Emilia-Romagna. The layout is especially designed to make the book very attractive and easy to consult, offering a clear and immediate understanding of all the details of the instruments. The book is completed by technical descriptions of each instrument, comparative tables of the heads and measurements.